An article in Foreign policy highlights how contractors behind schedule are taking advantage of lax labor laws and coercing their employees to bring their children to work alongside them, promising payments of bread and milk. 1. 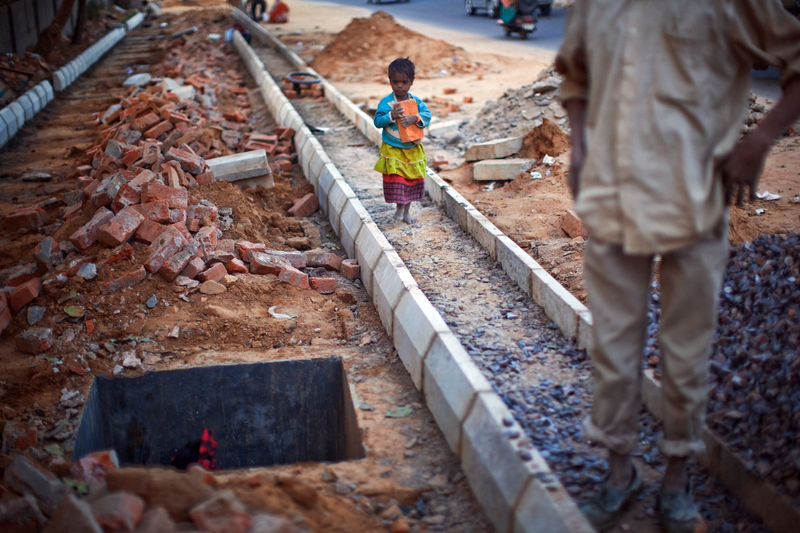 India has very weak enforcement of child labour laws. In fact, it is preferable to not working or prostitution. 2. This week, the High Court of Delhi began cracking down on the national government over alleged failures to provide legally mandated benefits to workers involved with the construction of venues related to the games. 3. At construction sites, laborers are making well below the standard minimum wage, and working children receive nothing but a single meal. 4. Almost half of the city’s homeless shelters have been destroyed in order to clean up the city and clear room for infrastructure, putting over 100,000 onto the streets in the middle of winter. DELHI HAS got a new police official ROBOCOP who is very much in news these days. With the Commonwealth Games round the corner and reports of constant terror threats, ROBOCOP is the new Mini Remote Operating Vehicles (MROV) that will help commandos in a hostage situation and even defuse bombs. Canada based ICOR Technology manufactured robot, ROBOCOP can not only trace the explosive but lift it and put it in a Total Containment Vehicle (TCV), which is used for defusing bombs. This way, bomb squad personnel will not have to expose themselves to the explosives. MROV has a robotic arm with a 5 degree movement including a turret, shoulder, elbow, wrist and claw joint. It can lift approximately 20 kgs and drag up to 130 kgs. The caliber T5 robot are used by Special Weapons and Tactics (SWAT) teams across the world and can also drag injured people to safety, climb stairs and negotiate rocky terrain. It has a maximum speed of 8 km /hr.